Occasionally a large piece of 2,000 year old Roman glass will surface and when it does it is turned over to one of the skilled artisans in Israel who turn it into a one of a kind design. 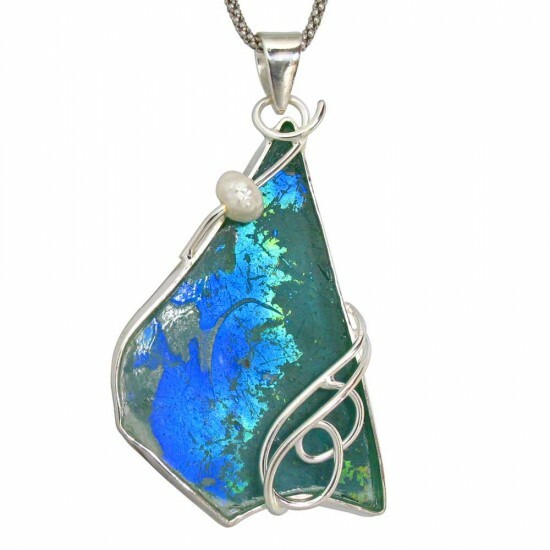 This piece has some of the most beautiful range of colors you ever see in Roman glass. The jeweler has set the glass in a very bold piece of sterling silver accented with a single pearl. Complete with on your choice of necklace. Like all of our genuine Roman glass pieces, your gift boxed pendant will arrive with a descriptive card and Certificate of Authenticity from Israel.